From an American point of view, it may be nice to compare local smithsonianus with argentatus from Europe and vegae from Asia. Vega Gull in 2nd cycle are illustrated HERE. 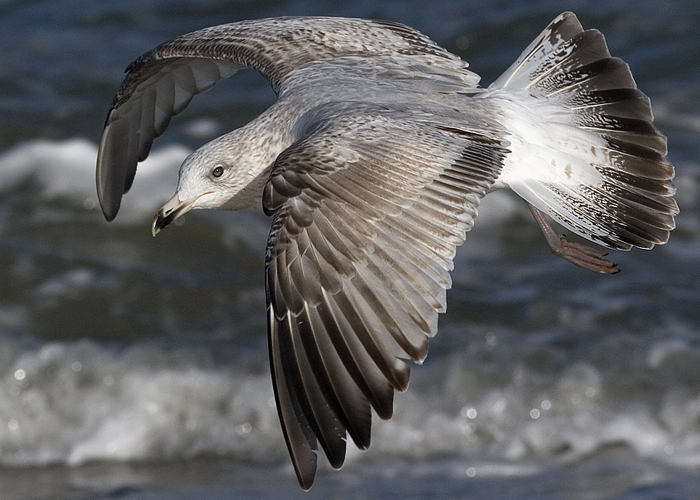 Below you'll find some example European argentatus and argenteus birds. 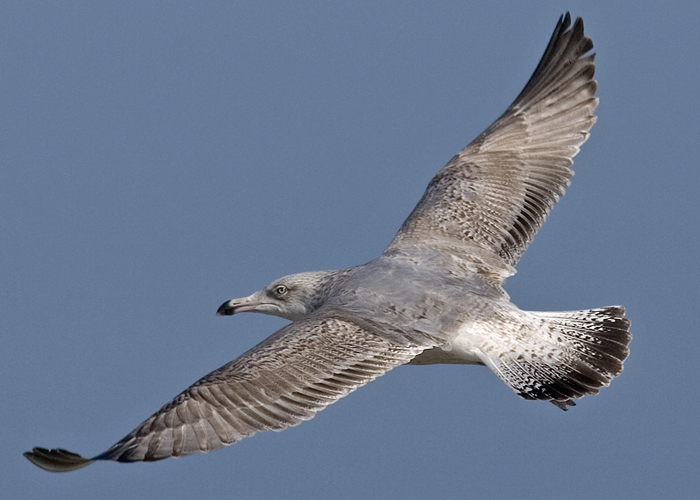 above: European Herring Gull argentatus argenteus SWAS 2nd cycle (2CY), December 02 2012, Calais, France. Picture: Jean-Michel Sauvage. From Belgium. Note 2nd gen primaries and moulted inner greater coverts and upper tertials. In general, bird much resembling first winter plumage. below: European Herring Gull argentatus argentatus KV48 2nd cycle (3CY), February 26 2008, Boulogne, France. Picture J.M. Sauvage. From N Russia (67.05N). Note compact body and snouty head. above: European Herring Gull argentatus 2nd cycle (3CY), January 23 2013, Katwijk, the Netherlands. Picture: Mars Muusse. Classic 2nd gen flight feathers. Black in tail limited to tail band and only proximal lining on central feathers. 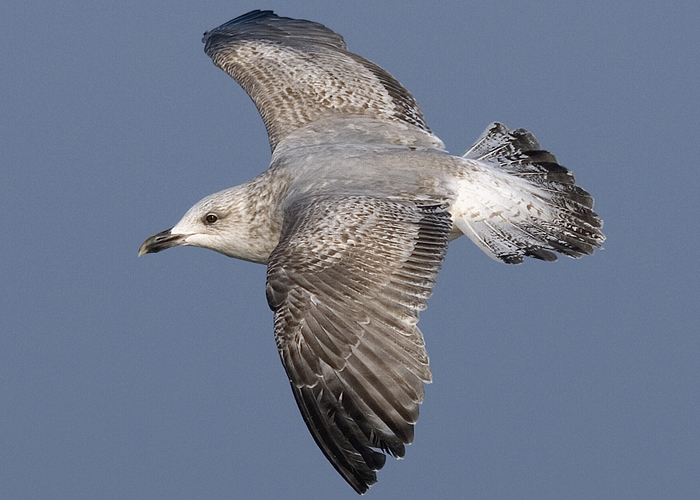 Very pale on rump, lacking bold dark pattern, and often already grey scapular 'saddle' in British argenteus. below: European Herring Gull argentatus argenteus PJAD 2nd cycle (3CY), February 03 2012, Vlissingen, the Netherlands. Picture: Theo Muusse. From Belgium. Note 2nd gen primaries. Limited black in outer rectrices and wide-spaced barring on rump. 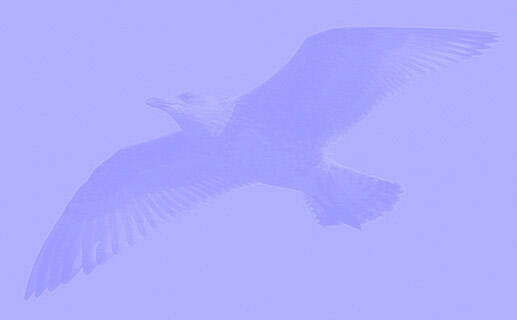 above: European Herring Gull argentatus 2nd cycle (3CY), February 07 2013, Katwijk, the Netherlands. Picture: Mars Muusse. Clear tail band and white, almost unspotted rump. Near complete grey scapular 'saddle' common in British argenteus. below: European Herring Gull argentatus March 05 2014, Katwijk, the Netherlands. Picture: Mars Muusse. Tail band and pale rump. Near complete grey scapular 'saddle'. 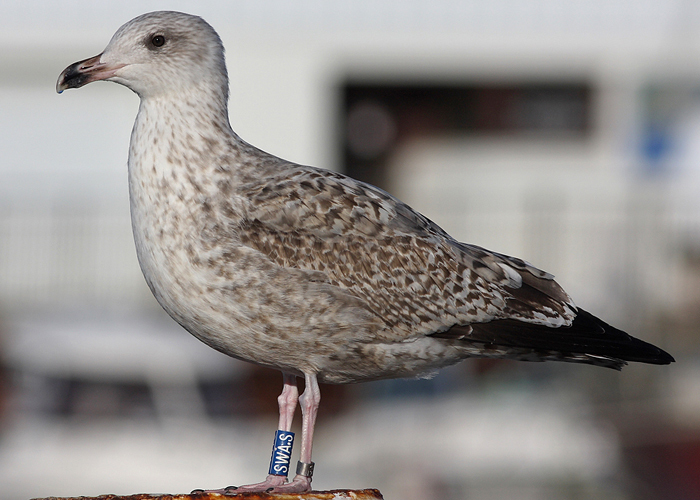 American Herring Gull (smithsonianus) Y30 2nd cycle (3CY), January 02 2015, Salisbury beach, MA. Picture: Dave Adrien. 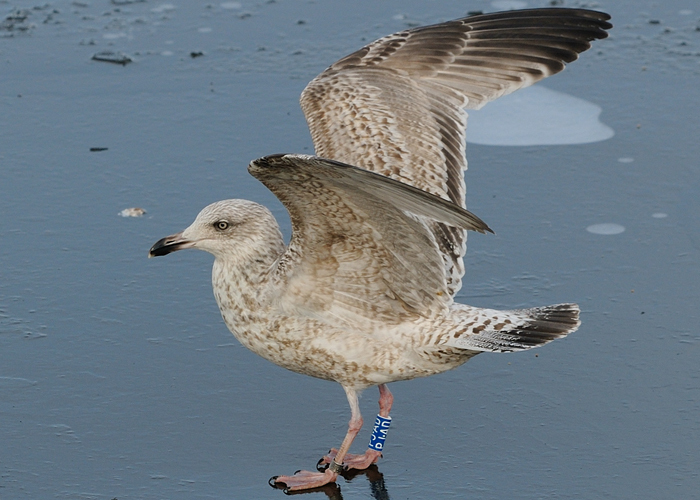 American Herring Gull (smithsonianus) 56C 2nd cycle (3CY), January 11 2016, Hampton, NH. Picture: Robbie & Colleen Prieto. American Herring Gull (smithsonianus) 34F 1st-2nd cycle (2CY-3CY), March - April 2016 & January - May 2017, Seaside Park, Bridgeport, CT.
American Herring Gull (smithsonianus) 3cy, January 04 2009, Coast Gulf - Texas, USA. 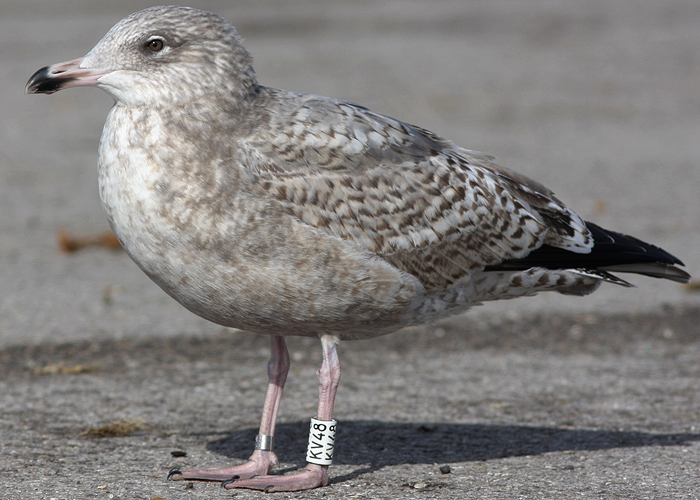 American Herring Gull (smithsonianus) 2nd cycle (3CY) 1106-13983 January 01 2015, Lake County, IL. Picture: Amar Ayyash. American Herring Gull (smithsonianus) 3cy (2nd cycle), January 21 2012, Chicago IL, USA. Picture: Amar Ayyash.